One named Dawn and one named Dave. Fly away Dawn. Fly away Dave. If you love Halloween and you know it, clap your hands……. 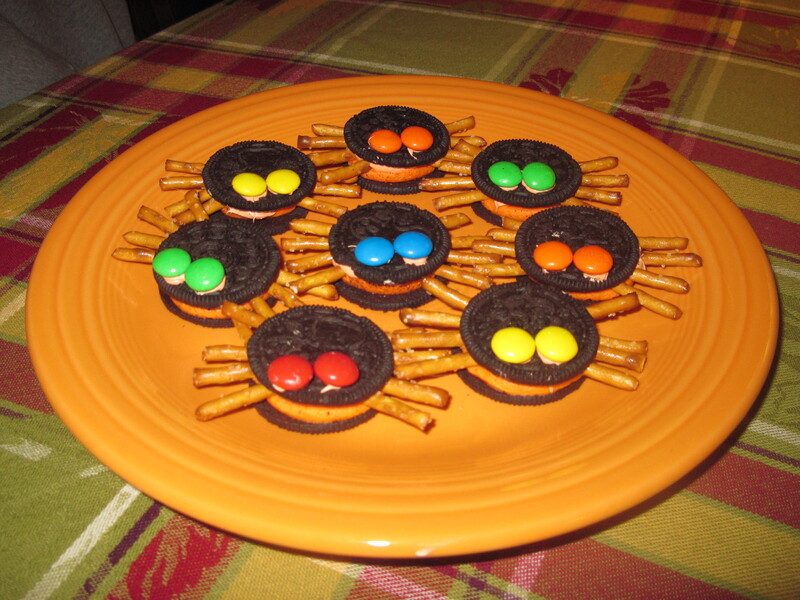 A variation on the Itsy Bitsy Spider: Sing this song three times, using a “great big scary spider voice” and a “teeny weeny spider voice” on those verses. The great big spider went up the water spout . . . The teeny, weeny spider went up the water spout. . .
Before doing this rhyme, it’s important to practice saying “BOO!” so that the children will know when to expect it and will not be scared. “Turn to your parent/caregiver and say Boo! to them.” Then practice the line tippytoe, tippytoe, tippytoe….Boo! An interactive book that will have children on their feet following along with the actions! In this story, little mice nibble windows and doors in their big orange house until it becomes a Jack-o-lantern. This is the Halloween version of ‘5 little monkeys jumping on the bed.’ A great one to get the wiggles out – It will inspire lots of jumping! 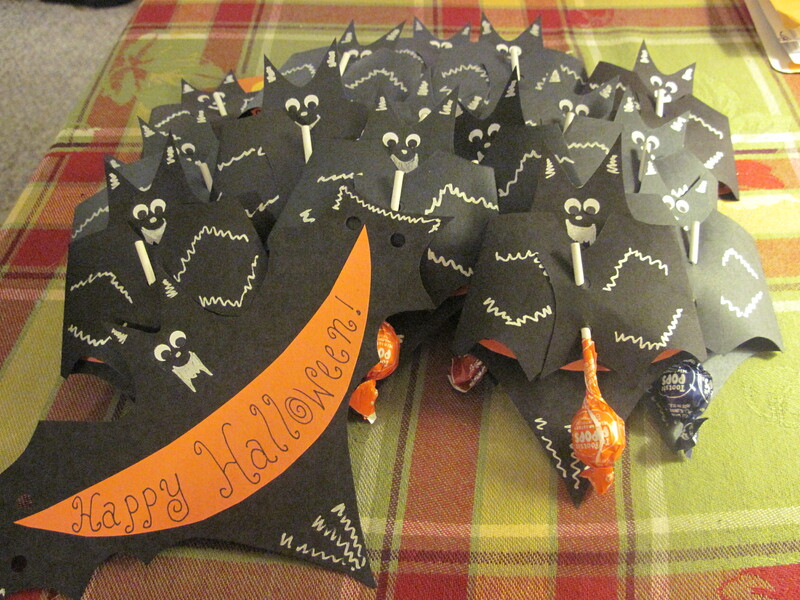 HALLOWEEN CARDS: I made these cute little bat cards to hand out. All you need is black paper, lollipops and a silver or white paint pen! 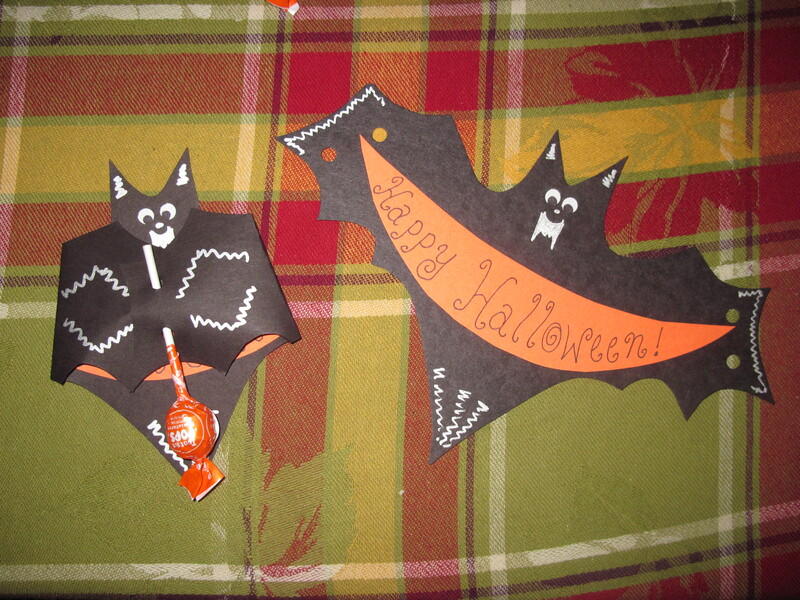 Template and instructions from: Better Homes and Gardens, Halloween Fun: 101 Ideas to Get in the Spirit. Love the ideas. But I did want to point out the the feltboard templates for Mouse’s Halloween House are actually in Judy Sierra’s Mother Goose’s Playhouse. Thanks for catching my mistake Diane! I’ve corrected it above. Great storytime! 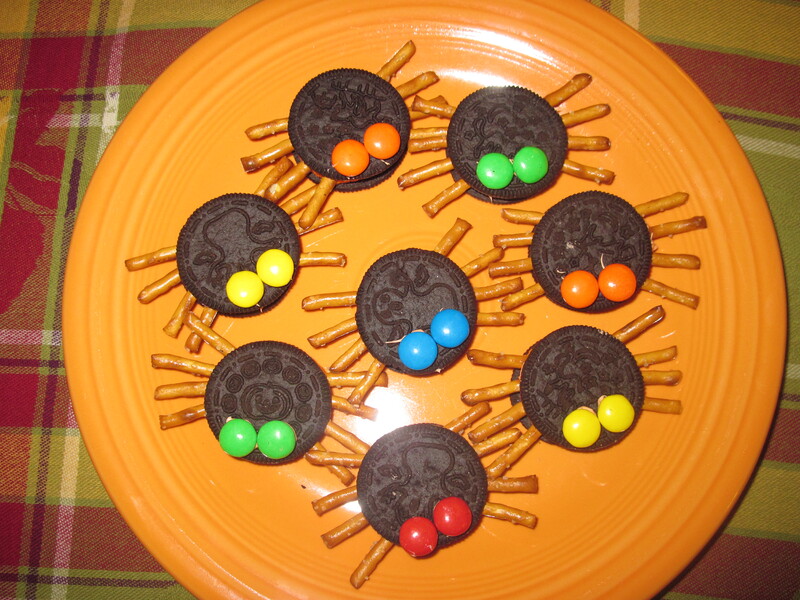 I was looking for a Halloween variation of Itsy Bitsy Spider for my Halloween storytime. Thank you! LOVE the bat cards. Very cool.